The BIOSTAT® D-DCU is a compact bioprocess system available in microbial or cell culture versions with vessel choices from 10 to 200L working volume. The optimized and proven design of the BIOSTAT® D-DCU is the result of thorough analysis of the most required features and functions from over thirty years of stainless steel fermenter | bioreactor design experience. This standardized solution eliminates design times, allows faster delivery, reduces cost, guarantees trouble free operation, allows for global service support as well as spare part availability. This is a gassing strategy uses a 3 | 2-way solenoid valve to direct either an air or O2 flow to the sparger. A manual flow meter visually indicates and controls the flow rate. O2 is pulsed via solenoid valve, when required to maintain the dissolved oxygen setpoint. Air is not provided at this time. You can optionally integrate mass flow controllers to measure and control the total gas flow rate via manual adjustment or automatically in conjunction with the controller, based on the signal of the pO2 probe and the selected setpoint. You can direct air, O2 , N2 and CO2 to the sparger and to the overlay. Flow meters visually indicate the flow rate for each gas. Add an additional gas flow path to the sparger or overlay outlet. Select optional mass flow controllers for each flow path, and switch gases between overlay and sparger. The detailed design of the Advanced Additive Flow gassing approach depends on your particular BIOSTAT® bioreactor system and configuration. Controls the flow rate of air and O2 individually, (N2 and CO2 also possible but not shown) to a single output, either a sparger or overlay. Employing the BIOSTAT® D-DCU 10-3 it is demonstrated in this study, that this fermenter meets the requirements for an E. coli high-cell density fermentation. 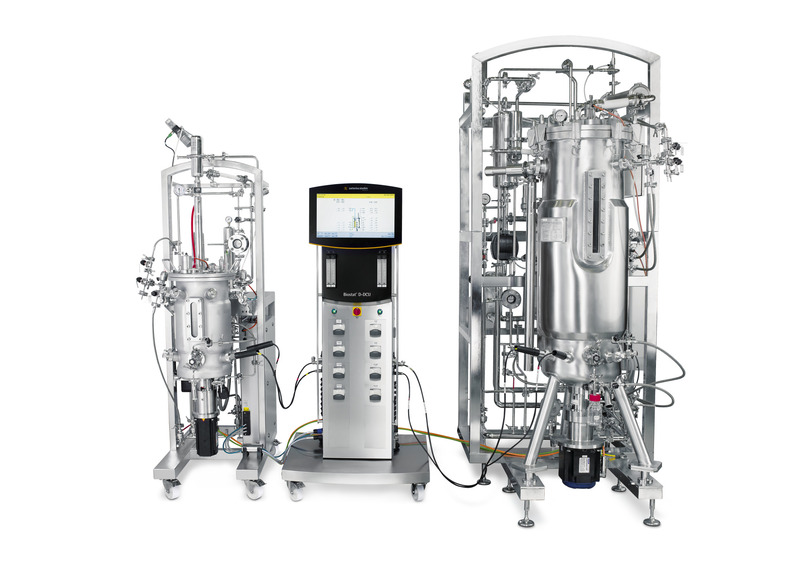 The performance capabilities of a bioreactor, which are substantially influenced by its design and thus, its bioengineering characteristics, are crucial in order to choose a system matching the specific process requirements. In order to guarantee a reliable comparison between existing bioreactor systems the DECHEMA guideline was published by an expert group as a standardized method required for the determination of the key bioengineering data. Here the BIOSTAT® D-DCU 30-3 and 100-3 are characterized according to this recommendation.